‘[In] literary articles in journals edited by marxists the concept of decadence is appearing more and more frequently of late. i discover that decadence includes me. this is naturally of great interest to me. a marxist actually needs the concept of decline. it serves to identify the decline of the ruling class in the political and economic spheres.’ This is from the diary of Bertolt Brecht, one of Germany’s most important 20th century playwrights who died 60 years ago today. Eugen Berthold Brecht was born in 1898 in Augsburg, Bavaria, into a mixed Catholic/Protestant family. He was educated at Königliches Realgymnasium, and then avoided the army by enrolling as a medical student at the Ludwig Maximilian University in Munich, where he also studied theatre. He never finished training as a doctor but did do some military service as a medical orderly. During the war, though, he had begun to write newspaper articles, under the name Bert Brecht, and he wrote his first play, Baal, in 1918, but it was not produced until 1923. He became increasingly involved in the theatre and cabaret world, being much influenced by the Munich comedian Karl Valentin. Brecht’s first produced play - Drums in the Night - was premiered in 1922 to rave reviews. In 1917, Brecht had begun an affair with Paula Banholzer, who had a child, Frank, by him, though she died soon after. In 1922, he married the actress Marianne Zoff, and they had a daughter, Hanne, though that relationship soon broke down, and, in 1924, he had a son, Stefan, with Helene Weigel. Five years later, he married Weigel, and they had a second child, Barbara, who would eventually inherit the copyright to all of Brecht’s literary works. In 1919, Brecht had joined the Independent Social Democratic party and become friends with the writer Lion Feuchtwanger. By 1924, they had collaborated on an adaptation of Christopher Marlowe’s Edward II - the first of many classic texts Brecht would adapt. The same year, he went to work at Max Reinhardt’s Deutsches Theater in Berlin - then one of the world’s leading theatres. He produced many well-received plays, not least The Threepenny Opera, adapted from The Beggar’s Opera with the composer Kurt Weill. Around this time, Brecht also published his first book of poems. In the early 1920s, Brecht started using the first name Bertolt, to rhyme with that of his collaborator, the playwright Arnolt Bronnen. Brecht had long been a student of Marxism, but, by the mid-1920s this interest was leading him to write political dramas such as Rise and Fall of the City of Mahogonny, also with Weill. In fear of Hitler, Brecht fled from Germany in 1933, first to Scandinavia, settling on the Danish island of Funen, then, in 1941, to California, writing poems and plays (such as Galileo and Mother Courage and Her Children) all the while. After the war, in 1947, he was interrogated by the House Un-American Activities Committee, but the day after left the US to return to Europe. After staying in Switzerland to begin with, Brecht settled in East Berlin, where he launched the celebrated Berliner Ensemble, but he wrote few plays in his last years focusing more on directing and teaching young directors and playwrights. In 1955, he received the Stalin Peace Prize, and, the following year, he died on 14 August. Further information is available from Wikipedia, Encyclopædia Britannica, or Theatre Database. Brecht seems to have kept a diary in childhood, although only one journal - the so-called Diary 10 written in 1913 (but which refers to earlier diaries) - appears to have survived (for more on this see Bertolt Brecht: A Literary Life by Stephen Parker at Googlebooks). He kept a diary in his early 20s: Bertolt Brecht Diaries 1920-1922, edited by Herta Ramthun, translated and annotated by John Willett, published by Eyre Methuen, 1979. 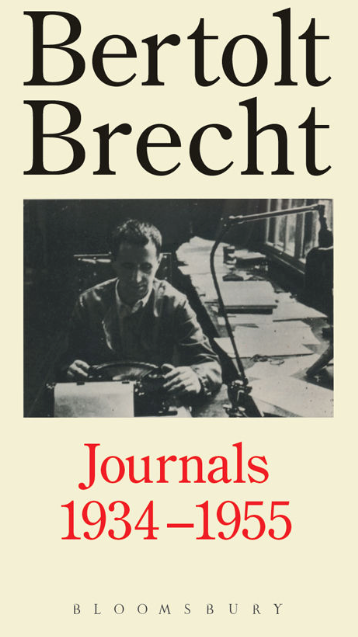 And again he kept a diary from 1938 until the end of his life (though he recorded little in his last years): Bertolt Brecht Journals 1934-1956, translated by Hugh Rorrison, edited by John Willett, and published by Methuen, in 1993. A review in New Statesman and Society of the latter, quoted by the publisher, described the book as ‘a marvellous, motley collage of political ideas, domestic detail, artistic debate, poems, photographs and cuttings from newspapers and magazines’. Here are several extracts.